Tyrone Proctor (Waacking): A pioneer of the urban dance form Waacking, Tyrone Proctor has been dancing since the late 1950’s in his hometown of Philadelphia. By the early 1970’s Tyrone was one of the featured dancers on Soul Train and toured the country and the world as a teen idol. In the 1980s, he choreographed for Jody Watley and other stars. He currently teaches Waacking in NYC and internationally. Evelyn Santos (Experimental): A staple on New York’s underground club scene since the 1960s, Evelyn Santos is a cultural icon in NYC, hosting seminal events such as Ain’t Nothing But a House Party, Body and Soul, Club Shelter, Temple and Paradise Garage. Evelyn has been recognized by the New York Times for her work as a choreographer and has been featured in films such as Maestro. Many in NYC’s underground dance scene consider Evelyn to be the Godmother of House. Cesar Valentino (Vogue): Dancer, Choreographer and Model Cesar Valentino is a fixture in New York’s ball community. Featured in such legendary documentaries as Paris is Burning and House of Tres, Cesar has danced in music videos for Toni Braxton and Carmen Electra, as well as designed runway and fashion shows throughout the U.S. and abroad. He was a featured voguer in Malcolm McClaren’s “Deep in Vogue” tour in Europe. 2010 marks his first time as a Judge of HDI. Desiree Faltine (House): Migrating to NYC from Trinidad in 1969, Desiree was a child of the 70s Disco era who later became a fixture at clubs like Paradise Garage, the Loft, Zanzibar and Bond St. International. Desiree opened her own club in 1995 called Behind Closed Doors and was the host of the First Annual Club House Jamboree in Brooklyn. 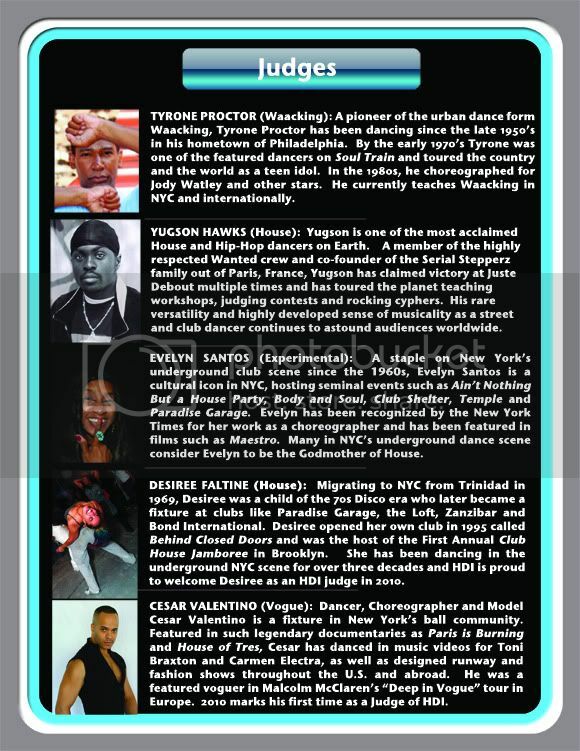 She has been dancing in the underground NYC scene for over three decades and HDI is proud to welcome Desiree as an HDI judge in 2010. 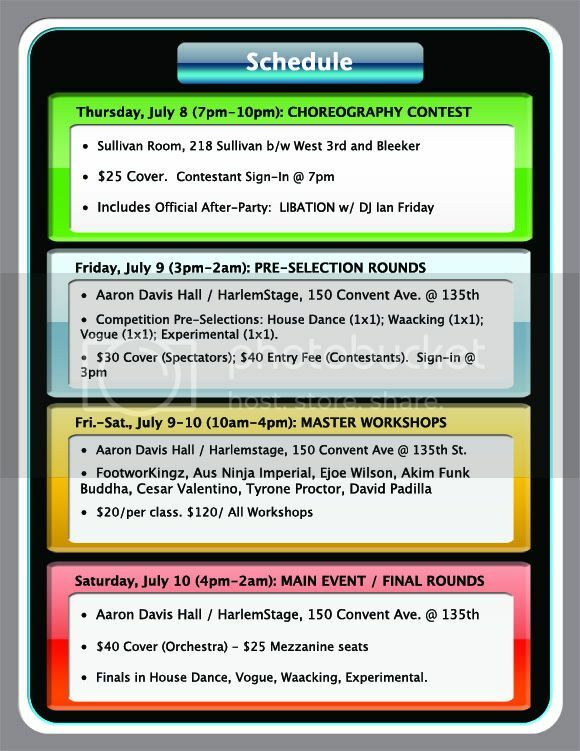 150 Convent Ave. @ 135th St.
• Contestants must report to designated location at 3pm on Friday, July 9. 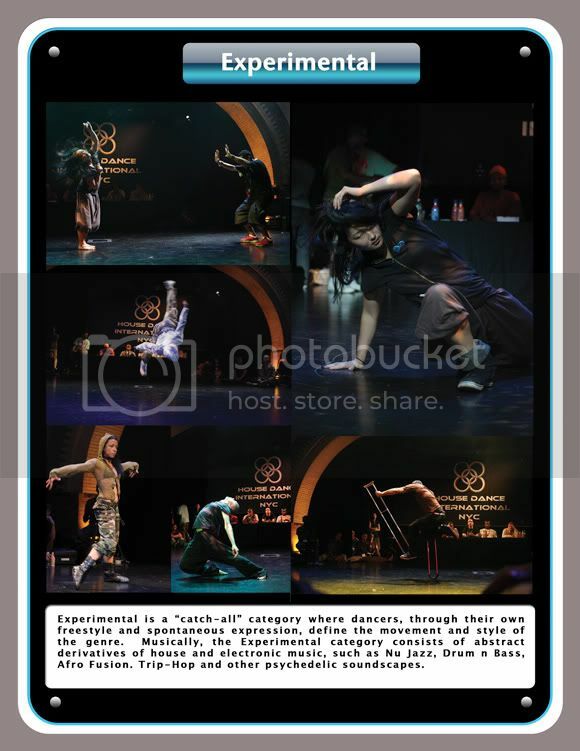 • Contestants may enter more than one category and must pay $40 fee for each category. • Competition registration includes admission to the preliminary rounds on Friday, July 9. Contestants gain free admission to final rounds on Saturday, July 10 if they qualify to advance. • $1000 prize in each category. 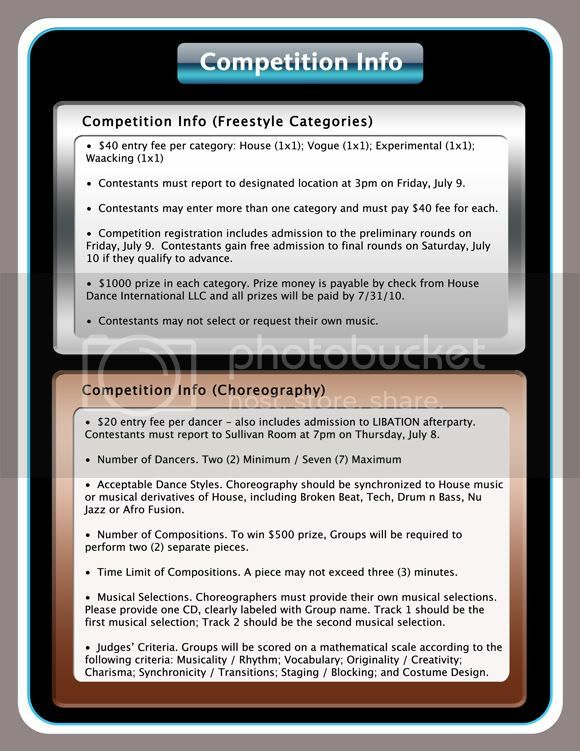 Prize money is payable by check from House Dance International LLC and all prizes will be paid by 7/31/10. • Contestants may not select or request their own music. • $20 entry fee per dancer - also includes admission to LIBATION afterparty. Contestants must report to Sullivan Room at 7pm on Thursday, July 8. • Acceptable Dance Styles. Choreography should be synchronized to House music or musical derivatives of House, including Broken Beat, Tech, Drum n Bass, Nu Jazz or Afro Fusion, etc.. 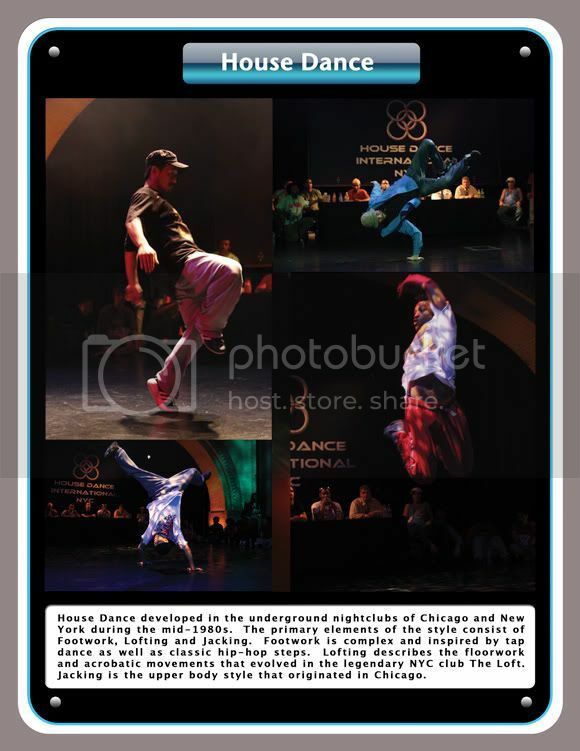 In other words, try to keep in the thematic structure of the HDI event: to celebrate underground styles of club dancing. • Number of Compositions. To win $500 prize, Groups will be required to perform two (2) separate pieces. • Time Limit of Compositions. A piece may not exceed three (3) minutes. • Musical Selections. Choreographers must provide their own musical selections. Please provide one CD, clearly labeled with Group name. Track 1 should be the first musical selection; Track 2 should be the second musical selection. 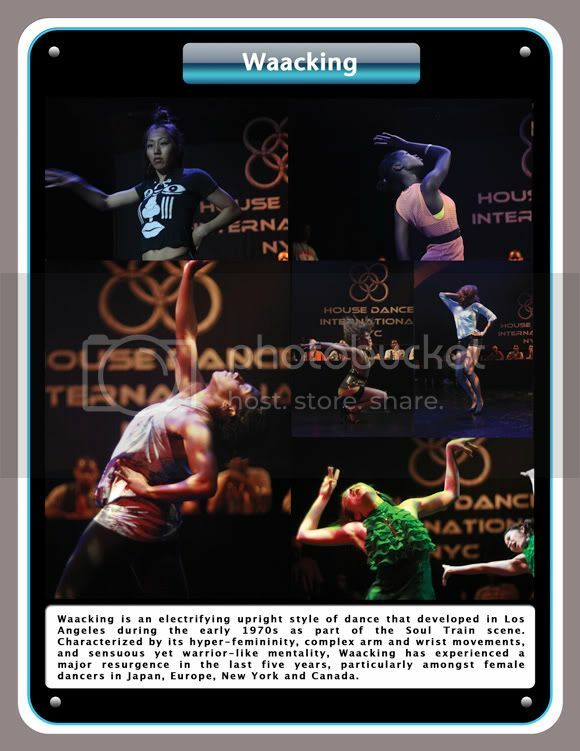 Interested in becoming a House Dance International sponsor? E-mail RED@theREDness.com for opportunities, details and packages.